I absolutely love almonds; marzipan, frangipane, amaretto, amaretti biscuits, macarons or in these mini stollen. They are so versatile, great for a gluten free option in cakes, can be used in curries and stews to help thicken the sauce and perfect to use for a whole host of patisserie recipes. I’ve used almonds here in these mini stollen, both in the dough and in the marzipan ball in the centre. 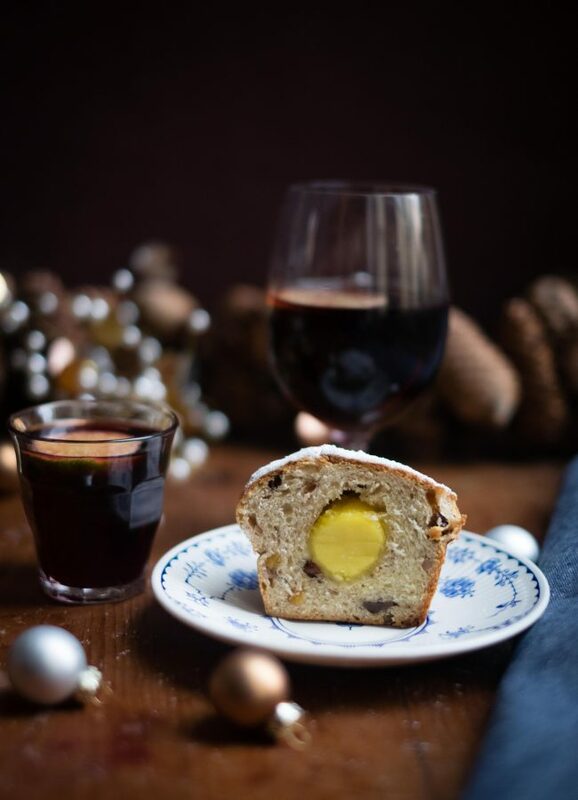 Stollen is probably my favourite Christmas bake, as much as I love Christmas cake and pannettone, they just don’t hit the mark. 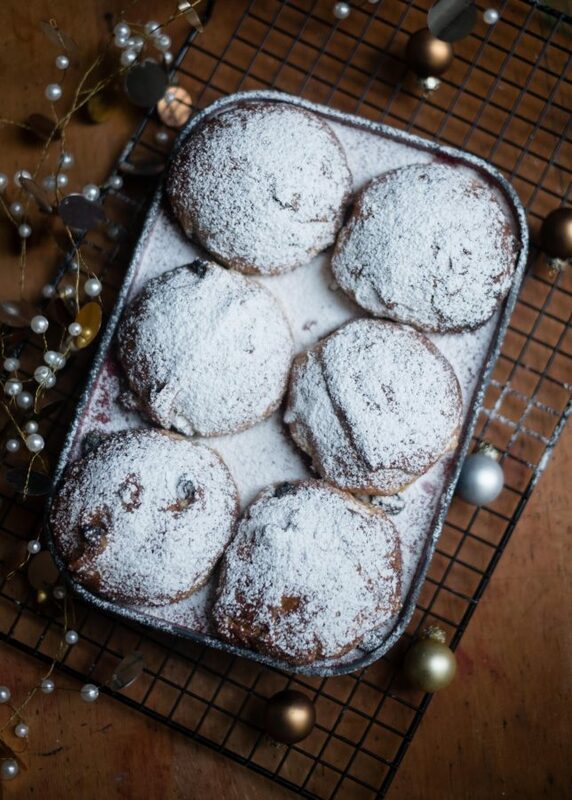 These mini stollen mean that you can have a whole stollen to yourself without feeling guilty. 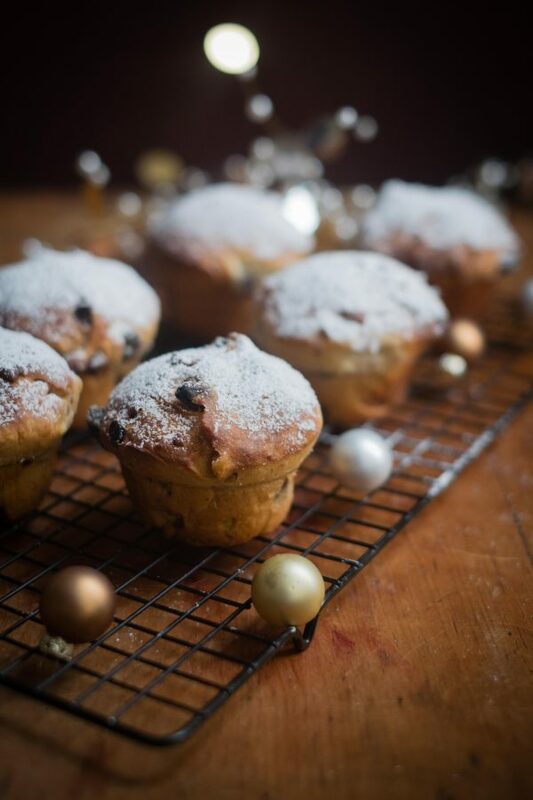 As they are in individual servings, these stay fresh a little longer than usual stollen and if they do get a bit dry, 30 seconds in the microwave really freshens them up and warms the marzipan centre nicely. 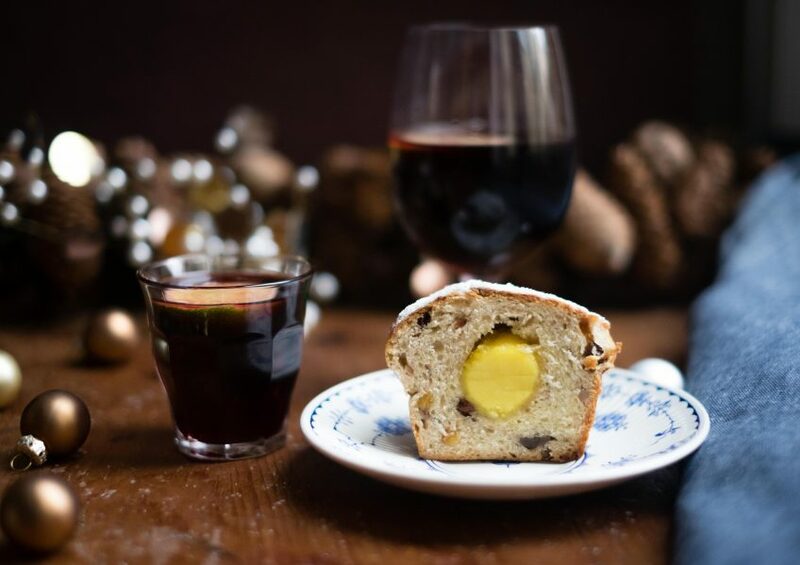 To make the mini stollen a bit more indulgent I’ve used sultanas soaked in homemade blackberry liqueur. You don’t have to make your own liqueur. you could soak the sultanas in chambord or cassis if you have some, but I do urge you to give it a try. The liqueur is so simple to make and it’s delicious added to prosecco, or used in a jelly, of course you can just drink it on it’s own too. It keeps for up to a year and gets better with time, becoming richer and fruitier. Stollen are really easy to make and they freeze well, so you could freeze some of these without the butter and icing sugar glaze. Then when defrosted, warm them in the oven and then glaze with the melted butter and icing sugar. 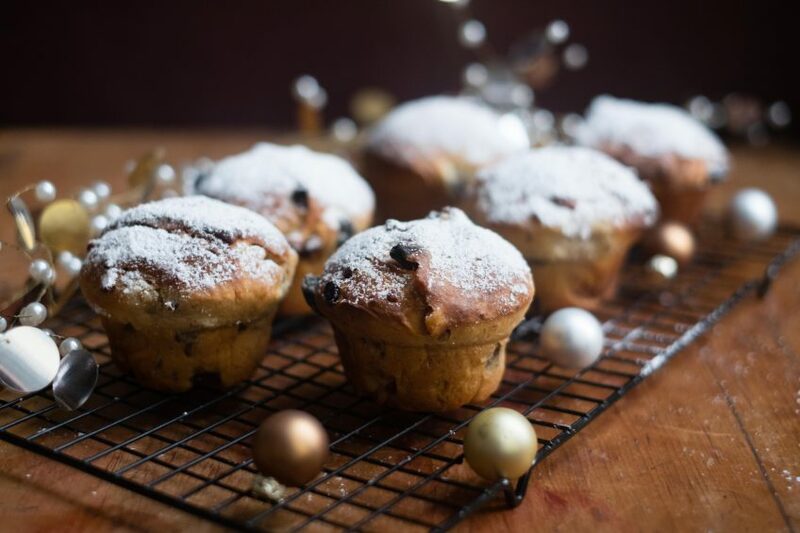 To make this recipe you will need 2 x 6 hole muffin tins, silicone are the best for even cooking and to easily turn out the mini stollen. The blackberry liqueur will produce more than you need, but it tastes great and can be used in cocktails, or drunk on it's own. You will need to make the blackberry liqueur a couple of days in advance or you can substitute it with rum or cassis. Place the red wine and blackberry puree in a bowl and stir it to mix together. Cover with clingfilm and leave for 2 days. Sieve the mixture into a pan and add the sugar, stir over a gentle heat until the sugar has dissolved and leave to simmer for 5 mins. Leave the mix to cool and stir in the vodka, place the liqueur in sterilised bottles and keep in a cool dry place for up to a year. To make the sultanas, combine the liqueur and the sultanas in a bowl, cover with clingfilm and leave at least overnight to absorb the liqueur. Sift together the flour, sugar and salt into the bowl of an electric mixer fitted with a dough hook. Warm the milk in a saucepan over a very gentle heat until it reaches 30-34C. Add the eggs, yeast, and milk to the flour mixture. Beat together for 10-12 minutes until the mixture is elastic and comes away from the sides of the bowl. Add the butter to the mixture in batches and continue to beat until the mixture comes away from the sides again and the butter is fully incorporated. Add the nuts, fruit, blackberry liqueur, mixed spice and mix until dispersed within the dough. Leave the mixture to prove for about 1½ hours. Divide the marzipan into 12 equal portions weighing 20g, shape into balls and place each one in a muffin tin hole. Knock back the dough, then divide into 12 equal pieces (I had 1440g dough which equals 12 x 120g). Knock back each piece, shape into a disc, place a ball of marzipan in the middle. 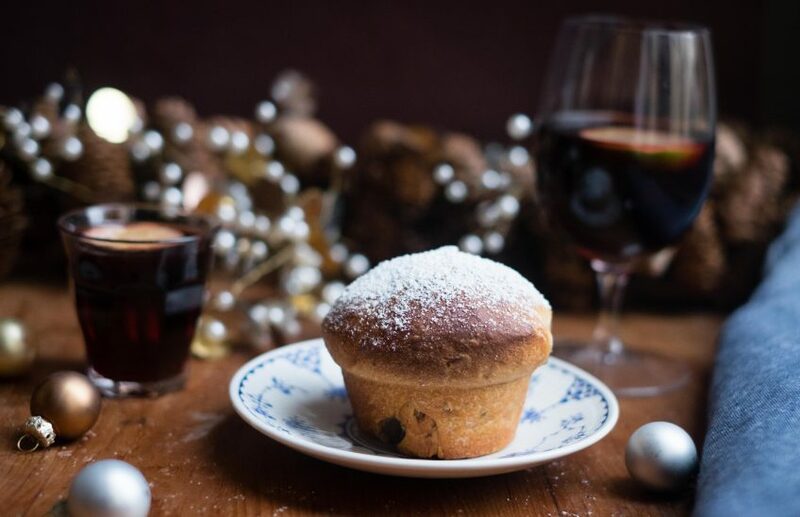 Arrange the dough around the marzipan, seal the dough at the bottom and place the dough seam side down in one of the holes of the muffin tin and repeat with the other 11. Leave to prove for about 45 minutes, or until it has doubled in size. Preheat the oven to 180C Fan/200C. Bake for 25-30 minutes until dark in colour and they sound hollow and feel cooked, you can test with a cocktail stick, but be careful not to stab the marzipan. Leave to cool for 10 minutes and then coat in the melted butter and dust with the icing sugar. These keep well for a couple of days, if they get a bit dry you can warm them in the microwave or the oven before eating them to soften them up. They also freeze well. I’m hoping to share at least one more recipe before Christmas Day, but if things don’t go according to plan and life gets in the way, I’d like to wish all of my readers a very Merry Christmas and thank you so much for your support over the last year. 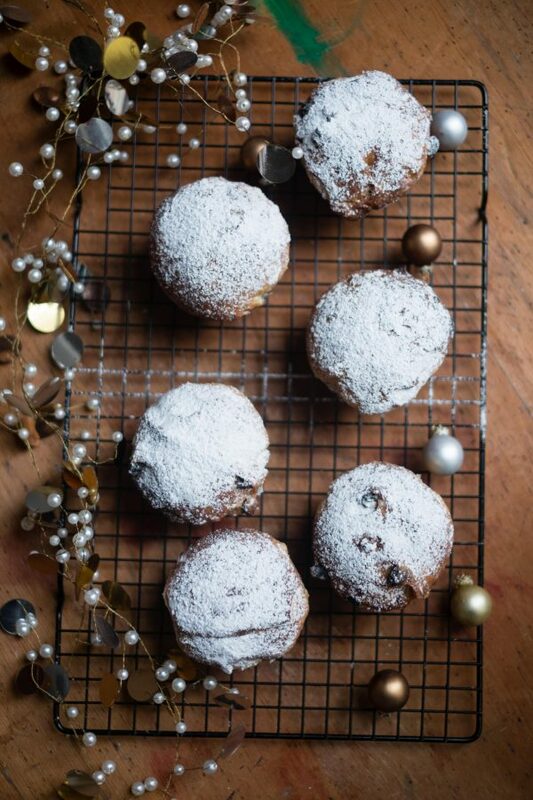 Loving your mini stollen, so pretty and much more practical than huge ones, as only me eats them in my house! This is making me feel so Christmassy! Omg, you make your own liqueur too?! I am so very impressed! I’ve never had stollen before but I see it on baking shows all the time. As always, your photos as just fantastic Angela! Oh Hannah – you have a stollenless house this year? But you do have some amazing cakes to eat, I’ve seen your posts. They are great in a muffin tin. Loooove stollen, your mini ones look adorable. Anything with marzipan and I’m right there! A woman after my own heart – these will not disappoint! This looks amazing! Almond is one of my discoveries – my mum never liked it but then as I got older – almond in EVERYTHING. So good. What a great bake. I love almonds in everything too! It’s one of my favourite flavours. I am so glad you came to almonds eventually, they are too good not to share. I adore almonds too and I’ve totally fallen in love with your mini stollen – well with the idea of them anyway 😉 I’ve never made stolen, although I promise to do it each year. I’ve run out of time for everything this year, so maybe 2017! I know that feeling, I had so many things I was going to make this year and once again I didn’t get round to it. These are so delicious, you should try them. That’s a great idea to pop them in the microwave when they get a bit dry….although I don’t think they’d stay around long enough to get to that stage. They look amazing! You’re right about them not lasting too long, but this makes a dozen and there are only 2 of us. They freeze really well too. Thanks so much for the lovely comments. These are so cute! I’ve never seen mini stollen before, but I always love mini things and love that these are portioned out! I love mini things too which is why I had to make them. Individual versions of big cakes always appeal to me. Such beautiful mini stollen! I love that marzipan center and that you soaked the raisins in blackberry liqueur. Wonderful addition to holiday baking. These are a great holiday bake. I love to soak the fruit I use in any recipe, it makes them so much more indulgent. What a fun baking project! Love these little guys! You’re right Katie this is so much fun, I love make enriched breads. I’ve never had Stollen before – can you believe it??? I’m loving these mini ones! They look wonderful and those flavors sound DELICIOUS! You’ve never had stollen? Wow you poor thing, it’s completely delicious, you’ll love it. These are great.